SpliceSeq is comprised of three components, SpliceSeq Viewer, SpliceSeq DB, and SpliceSeq Analyzer. 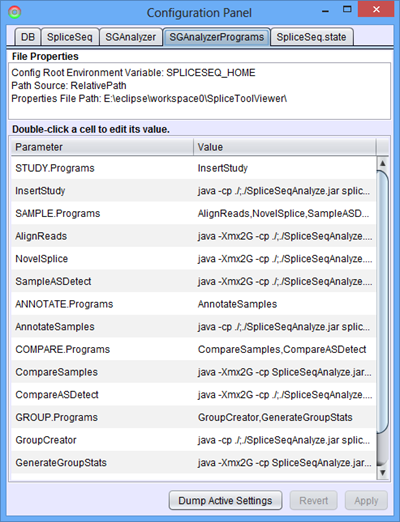 SpliceSeq Viewer is a Java-based application which can be launched by webstart or installed and run on your local machine. SpliceSeq DB is a MySQL database which contains the gene structures and sample read statistics. 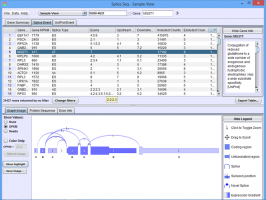 The SpliceSeq Viewer accesses the SpliceSeq DB to retrieve splicing analysis results. SpliceSeq Analyzer performs alignment and analysis of RNASeq data and loads the results into the SpliceSeq DB. When SpliceSeq Viewer alone is installed and launched without your own SpliceSeq DB installed, you can still browse data from our server or from a colleague’s database to which you have access. 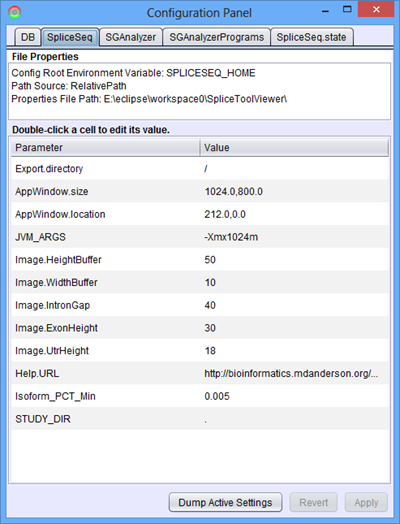 SpliceSeq Viewer is a JavaTM application that runs on Windows, Linux, or Mac OS X. A 64 bit version of Java may be required if you plan on performing analysis of large RNASeq files. 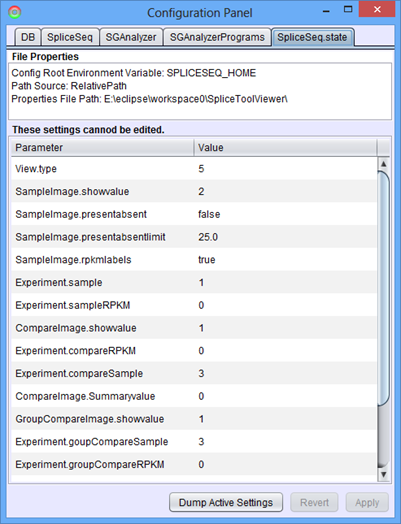 A Java Web Start version of SpliceSeq Viewer can be run simply by clicking the icon below. The Web Start version is configured to use a pre-loaded SpliceSeq DB to allow users to try out the application. You can change a configuration setting to open other SpliceSeq DBs or use your own SpliceSeq DB on your local machine. Click Launch button to run! If you are prompted by your browser for permission to launch the application with Java Web Start, click OK. Also, if prompted about trusting the application, confirm that you trust the application. SpliceSeq Viewer will then start. By default it will be connected to our SpliceSeq DB and allow you to explore this data. If you would prefer not to use Java Web Start, see Local Installation below for instructions on installing SpliceSeq Viewer in your local machine. DBURL – This is the DB connect string and contains the URL to get to the database server (for example, jdbc:mysql://localhost for a database on the machine where SpliceSeq Viewer is installed or jdbc:mysql://projects.insilico.us:3306 to connect to another server through a specific port). We run a web service to provide access to our pre-loaded SpliceSeq DB in a way which does not have problems with firewalls. This connections will have a DBURL of jdbc:ratway://projects.insilico.us.com/Ratway/RW. SGDatabase – This is the name of the SpliceSeq DB on the server. Default is SpliceGraph. Note: Windows sometimes forces database names to be in lower cases, so if ‘SpliceGraph’ does not work try ‘splicegraph’. DBUser – MySQL user ID for connecting to the SpliceSeq DB. DBPassword – MySQL password for connecting to the SpliceSeq DB. Note: You must click ‘Apply’ after changing the DB settings. To create and load your own SpliceSeq DB, see instructions on Installing and Loading SpliceSeq DB below. If you plan to analyze your own RNASeq samples, you will need a SpliceSeq database. The database and sample analysis can be done on a user workstation if it is fairly powerful (64 bit OS, with 8+ Gig of RAM) or on a computational server. If you are going to use a computation server (e.g LINUX rack mounted server) for the database and computation, you can set up the SpliceSeq Viewer on user workstation(s) and configure it to connect to the data on the compute server using the steps outlined in the previous section. One SpliceSeq database can be shared by multiple researchers. 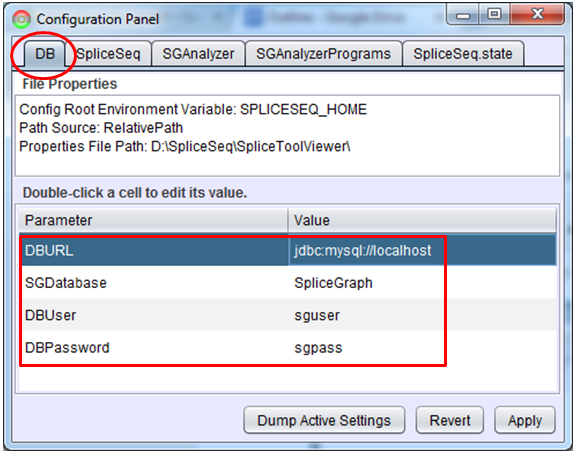 To create SpliceSeq DB, you need MySQL Database Server 5.5.x . MySQL is often installed by default on LINUX servers or can be easily installed using ‘yum install mysqld’ or ‘apt-get install mysql-server’. Install instructions for other platforms are provided here MySQL Install . Using a database login with permissions to create databases, add an empty database, which will be your SpliceSeq DB, to your MySQL instance and create one or more mysql ids with permissions on the new SpliceSeq DB. It is important that the database be created with the latin1 character set. You will also need a database user with full permission on the database in order analyze / load RNASeq data. Create another MySQL user (for example, sgload) with a password (for example, sg4ld! ), and then grant full permission on the new SpliceSeq DB to the new user. Finally, some initial tables and data must be loaded into the blank SpliceSeq DB you have just created. Download, unzip, and load the current SpliceGraphDB on the machine that is hosting your new SpliceSeq DB. Use the MySQL user ID with full database permissions defined above to load the initial data into the database. Modify the DB tab of the SpliceSeq Viewer configuration panel, as outlined in the Configuring SpliceSeq Viewer to Access the SpliceSeq DB, with the appropriate server, database, user ID, and password. If the you plan to load data from the SpliceSeq Viewer use a MySQL user ID with full database permissions. If not, configure the SpliceSeq Viewer with a user ID that only has select permissions. If you plan on analyzing your own RNASeq samples, you will also need SpliceSeq Analyzer. SpliceSeq Analyzer is included in the local installation package and does not need a separate installation step. However, SpliceSeq Analyzer relies on an external alignment program Bowtie, which should be installed and configured as described in the next section. The SpliceSeq Analyzer requires a Bowtie (version 1), which is used to align read data to splice graphs. Note, SpliceSeq uses the original Bowtie aligner not Bowtie 2. Also, if you are going to run sample alignments on a 64 bit computer, it will run faster if you install a 64 bit version of Bowtie. After installing Bowtie, SpliceSeq Analyzer must be configured so that it knows where Bowtie is installed and where it may create alignment related files. On the SGAnalyzer tab of SpliceSeq Viewer’s configuration panel (File - Configuration), the BowtieExe and BowtieDBBuildExe parameters need to be set to the location where you installed Bowtie. The BowtieDBPath just needs to be set to an existing directory where SpliceSeq Analyzer can put the Bowtie databases that it generates. The ResultsDir needs to be set to a directory on the machine where temporary files can be placed while loading new samples. Note: If you are planning on running SpliceSeq analysis on a LINUX compute server, you can install analyzer by unzipping SpliceSeq.zip into the directory of your choice. Instead of using the GUI to configure the bowtie location, you can edit the SGAnalyzer.properties file directly. 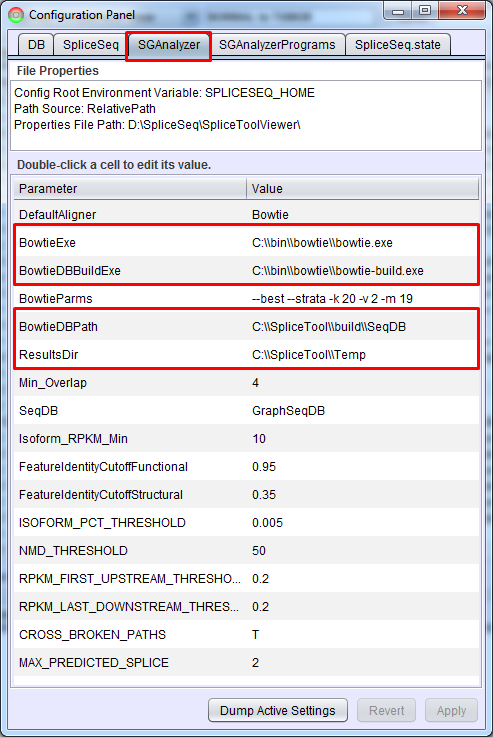 If bowtie is in the path of the user running analysis you can just specify ‘bowtie’ andbowtie-build’ for the BowtieExe and BowtieDBBuildExe parameters. BowtieDBPath and ResultsDir can be fully qualified paths or relative paths if analysis will always be started from the same directory. The directories specified by BowtieDBPath and ResultsDir must exist. This section briefly describes some additional configuration tabs that you may see in the Configuration Panel. These configurations are generally not meant to be adjusted by the average user. Please feel free to contact us if you have any questions. This panel contains the list of Java programs as well as the Java Virtual Machine (JVM) command line parameters used to run each step in the data loading process. If a memory issue is encountered during data loading, one thing to try would be to alter the JVM parameters to increase heap size and thread stack size. Also, if you wish to turn off the novel splice detection feature, you can remove “NovelSplice” from the list in SAMPLE.Programs. The SpliceSeq.state tab is actually not a configuration file, but a cookie storing the internal states of the program. It is only used for debugging purposes, and cannot be edited within the Configuration panel.